Fed up with your battery dying before you get to the end of that all important document or movie? We can help. AVG TuneUp prolongs your battery life right when you need it. Download, install, and get ready to tune up your PC. Download AVG TuneUp here. 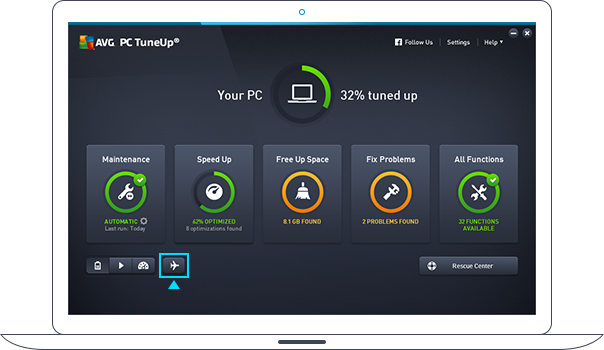 Then click the downloaded file to install AVG PC TuneUp®. After launching PC TuneUp, you will be greeted by the welcome screen. You can skip the scan to get to the main dashboard. Many programs will run in the background and call on your processor’s full power for even simple tasks. While this may help their performance, it also drains your battery faster when you’re not plugged in. Economy mode will turn off power-sapping programs with the click of a button. Click on Economy Mode (battery icon) in the lower left corner. If you’ve never used it before, you'll be able to choose between moderate or maximum power saving. TIP! Found a power outlet or back at home? Switch back to Standard Mode by clicking the play icon. Helps improve battery life by reducing power consumption. So what’s behind the magic? Economy Mode reduces your processors’ power consumption for maximum battery life whilst still maintaining enough performance for basic, everyday use. Economy Mode reduces the power consumption of many built-in and connected devices. Economy Mode switches off unnecessary background processes that slow PC performance down. Even when you're not using them, active WiFi and Bluetooth components in your PC scan every passing network looking for a connection. This search is very battery intensive. Flight Mode can help you get more battery life whether you are on a plane or not by turning off those functionalities. Simply click on the Flight Mode (plane icon) switch to turn off Bluetooth and Wi-Fi get the most out of your computer's battery while on the road. Your PC should already be saving battery. Want more? Check out our Ultimate Guide to boosting your computer.